Maine Education Commissioner Stephen Bowen observes sixth-graders at Gray-New Gloucester Middle School on Friday, June 1, 2012. 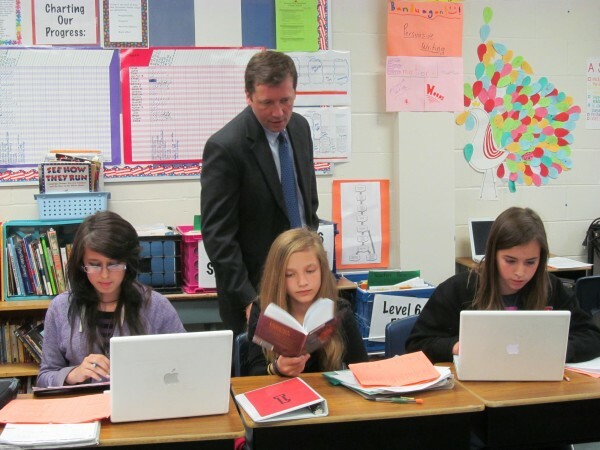 Bowen visited the school because it is among the state's leaders in implementing proficiency-based learning strategies. Maine Education Commissioner Stephen Bowen asks questions of students at Gray-New Gloucester Middle School on Friday, June 1, 2012. 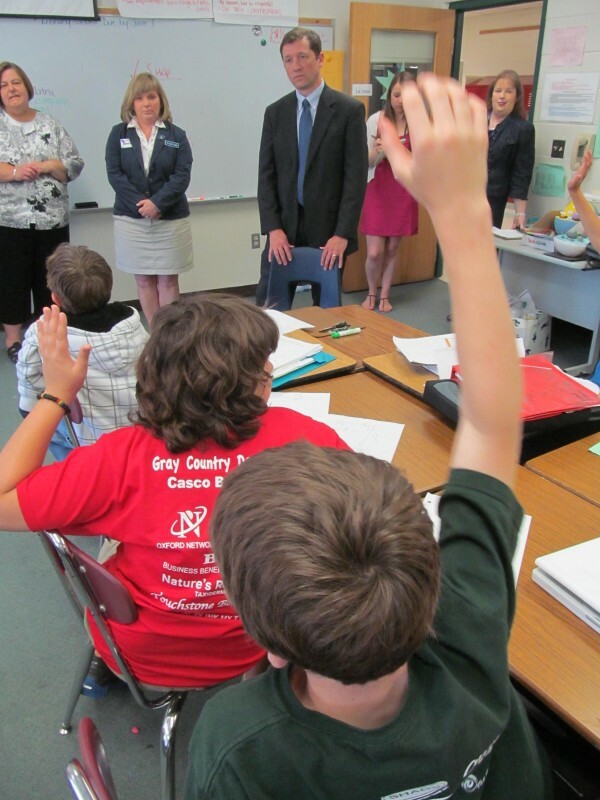 Bowen visited the school because it is among the state's leaders in implementing proficiency-based learning strategies. GRAY, Maine — A cutting-edge education experiment at Gray-New Gloucester Middle School could become the norm in Maine if Education Commissioner Stephen Bowen has his way. On any given day, students from as many as three grades can be found studying together in the same classroom. Instead of letter grades, student performance is based on a numbered system in which 4 means proficient and a 1 or 2 means the student has more work to do before moving on. And teachers who were used to pulling entire classes of students through the same lessons at the same speed now are responsible for monitoring each student’s progress individually. Only a handful of schools in Maine are embracing proficiency-based learning to the degree that Gray-New Gloucester schools do, though Bowen said many more are in the early stages. That’s why Bowen, who is pushing a new education strategy for Maine that includes many of those concepts, visited the school Friday, where students, teachers and administrators told him their experiment is a work in progress and hasn’t advanced without challenges. Fifth-grader Abbey Chandler told Bowen she doesn’t see her schoolwork as an experiment. “We’re not guinea pigs,” said Chandler pointedly during a question-and-answer session with Bowen where the students were the ones providing the answers. “What are you?” said Bowen with a chuckle. If the model in use in the district isn’t an experiment, then it’s a study, at least for those looking in from the outside, according to Principal Sherry Levesque. She said less than three years into the new strategy, dozens of people from other school districts in Maine and beyond have visited to watch how Gray-New Gloucester Middle School is pulling it off. Since becoming the state’s education commissioner last year, Bowen has been consistent in terms of his desire to reform education in Maine — and to do it without costing state or local taxpayers any more than they’re paying now. A key part of his strategy — which he released earlier this year in written form — is the idea that students don’t learn at the same rates and therefore shouldn’t be taught that way. But even he says that going from what most schools have done for decades to the new model is a monumental task. “It’s not a program in a box that you can just unpack,” he said. Kristi Fecteau, who teaches math and science to students in levels five and six — levels based on their abilities, not grades based on their ages — said she was apprehensive when administrators and the MSAD 15 board started discussing the proficiency-based model a few years ago. She said overall, it has made her job harder. Various teachers do it differently, but in general most classrooms at Gray-New Gloucester Middle School are adorned with charts on the walls that mark each student’s progress through milestones, whether it’s earth science or long division. Fecteau said in her class, each day starts with meetings between students and teachers — Fecteau team-teaches with someone else — about what the students’ goals are for that day. All of it is carefully tracked with software and individual assessment folders. Fecteau said a positive effect is that most students seize control of their own progress without being asked to. Lisa Knedler, another teacher at the school, said the magic of the program is mostly on the student side, not the teacher’s. Some are skeptical, including parents, according to eighth-grader Rachael Lachance.